In about an hour, Yasiel Puig will embark on the toughest quest of his baseball career. Learning to control his aggression, making adjustments at the plate, and perfecting his prized bat flip technique are all easy compared to what he’s being asked to do today: not humiliate the Dodgers franchise in the Home Run Derby. Quite frankly, it seems impossible because it’s never really been avoided before. In 1993, Mike Piazza broke out. An unheralded draft pick, Piazza rose through the ranks and promptly became one of the best hitters in the league in his first crack at a regular job, posting an .899 OPS at the break along with 18 homers. Expectations were high and people were excited and … zero. So it began. Piazza returned the next year in 1994 even better at the break. He slugged 21 homers en route to a .927 OPS in the first-half. After getting the jitters out the previous year and now having a season and a half of success under his belt surely he would star in … zero. THE WORST. In 2005, the MLB did this dumb “international” Home Run Derby where they invited players to represent their country even if they weren’t, you know, actual All-Stars. Hee Seop Choi, being from Korea and having 13 homers, was given the nod as MLB presumably scrambled to find eight countries with semi-acceptable candidates to push their idea through. Expectations were low since he came into the game with a .777 OPS and fans were debating whether he should be on the roster, not whether he was a star. 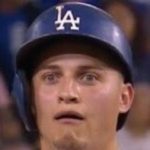 So of course he slugged five homers, the most by a Dodger in the derby ever by far … then failed to play in the MLB again after the year ended. Matt Kemp‘s 2011 was a supreme athlete putting everything together and slugging 22 homers with a .982 OPS made him an early MVP favorite. Surely nothing could go wrong at the derby since nothing WAS going wrong for him in anything. Then he hit two homers and added a FOURTH LAST PLACE FINISH out of five chances to the Dodgers’ history books. WHY?! For the 2012 Home Run Derby, Kemp returned despite being on the DL AND not playing since May 30 due to hamstring issues. Still, he was voted into the All-Star Game and chosen for the derby on the strength of 12 homers and a 1.163 OPS. At the time, the consensus was “ZOMG WTF ARE THEY DOING WHY HE’S GONNA DIE NO“, so it’s tough to say there was too much shame when he finished with a single homer, especially since Robinson Cano humiliated himself with zero after winning the damn thing the previous year. Honestly, everybody was just happy he didn’t explode on live TV. And that brings us to 2014 and the Yasiel Puig experience. Puig enters with a .915 OPS, but only 12 homers. And he’s in the middle of a pretty bad homer drought, with only one since May 29. So the hype shouldn’t be all that significant, but it’s Puig and it’s bat flips and it’s the big stage, so it’s time for either total letdown or MAXIMUM PUIG. Interesting thing to note is that despite the lowest amount of actual homers in the 2014 season out of the competitors, Puig is actually tied for being the second-most likely to win the damn thing at 5/1, according to Bovada. That’s either squares buying into the hype or sharps in Vegas are buying into his batting practice shows.